I was very lucky to be allowed to take the below photo. My guide told me that there are two production lines within the factory . Due to the economic crisis there is only one production line currently in operation. 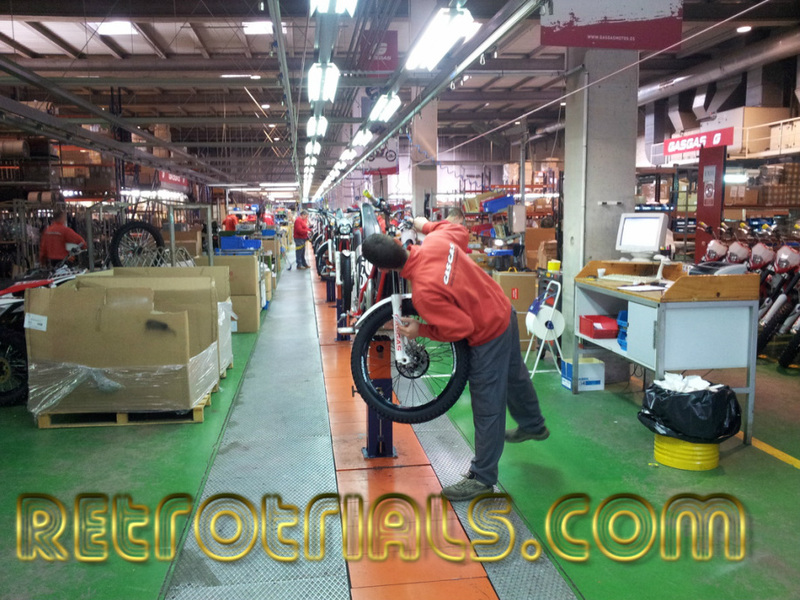 It will follow demand that one week it might produce trials bikes and the next Enduro . The staff are trained to assemble a number of different machines. He explained that the company is small and flexible. One of the last tasks being carried out in front of you in this photo was the application of the decals. The engine assembly is carried out at the back of the factory and out of bounds. I wasnt allowed in room any further down that the 2nd pillar. The guide showing me around explained that photos were not allowed under any circumstances. To the right handside was a parts storage area. To the left behind me , were rows of motorcycles ready to go through the final testing. Next to these rows were 4 mechanics working on individual machines - not on a production line. Each machine is test ridden around the private road outside of the factory but within the grounds. The bike is then brought back . If adjustments are required they are handed to these mechanics to sort and make perfect.Behind me there was a small independent detached room within the huge room i was standing in. Outside this room were computers on desks sitting in front of windows looking into the room. These was a dyno room. Whilst GasGas do assemble the engines on site , the rest of the motorcycle is assembled here after receiving parts from suppliers. 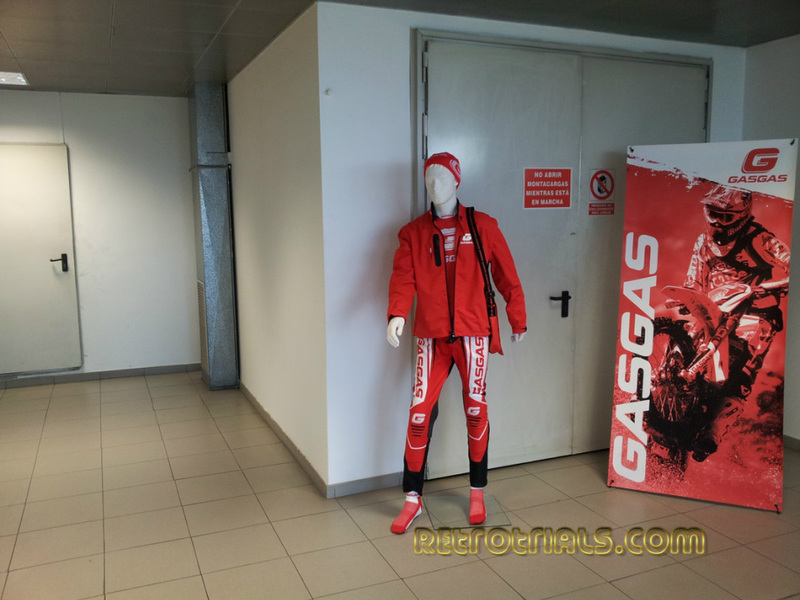 With the production line working wel,l GasGas can produce 80 motorcycle per day. After leaving the factory floor we walked back into the reception and then up the marble stairs to the offices on the first floor. This area is fairly spacious but not as large as id have thought it would be . It forms only a small area of the internal roof space in comparison to the factory down stairs. 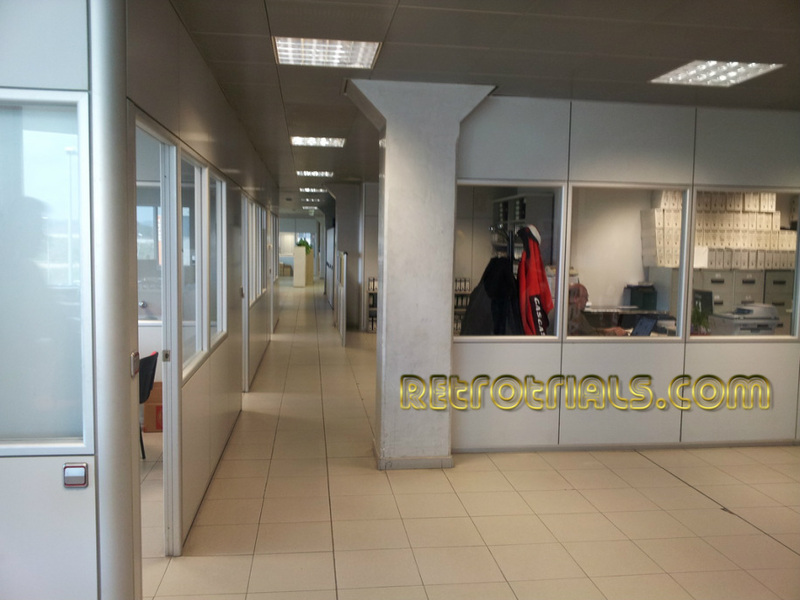 This first floor is subdivided into offices for sales, marketing , factory manager , general manager , press officer etc. At the top of the stairs was a door that was closed with a swipe card access. I asked what was through the door . My guide then explained to me that this was the research and development area. He explained that only a few workers were ever allowed into this area and general access was not allowed . This was because the factory wanted to eliminate any chance of any information or photographs escaping from the department and being leaked.This might give the competition an advantage. I was not allowed into this area. I was lucky to even be upstairs. From the way our guide was acting i got the impression that he wasnt too easy about it either. Through the single door seen on the left of the photo beneath was the first floor parts department. The parts department was a scene of real hussle and bustle.Workers were shifting boxes around from one place to another. Shelve racks filled the room well stocked with everything you could imagine youd need for a GasGas. On the right of the room were boxes marked up with the names of importers and riders around the World. I saw many boxes including one marked "Shirty"' and another marked up for Tommi Avhala. 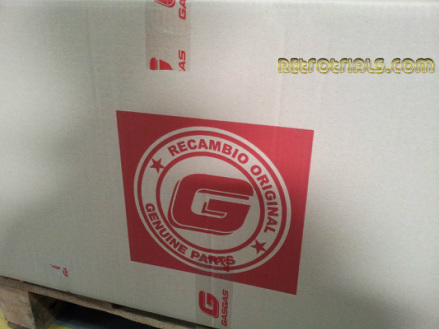 The guide explained that the spares that the importer requested would be put into the box and would be went with the next shipment of motorcycles. He explained that the biggest market in the World to GasGas was now France. France is buying 2000 bikes per year. Behind France is the Uk and then Germany. 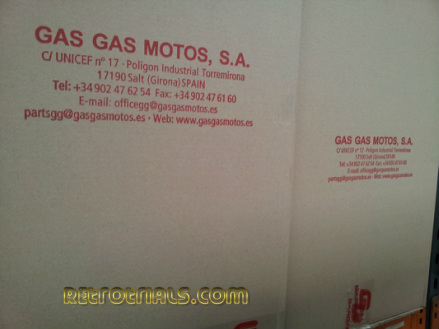 Spain in 2007 was the 4th biggest market for GasGas. Now Spains demand has fallen dramatically to 40% of those heady days. The crisis has really taken hold and it is really bad here. Japan is a growing market. 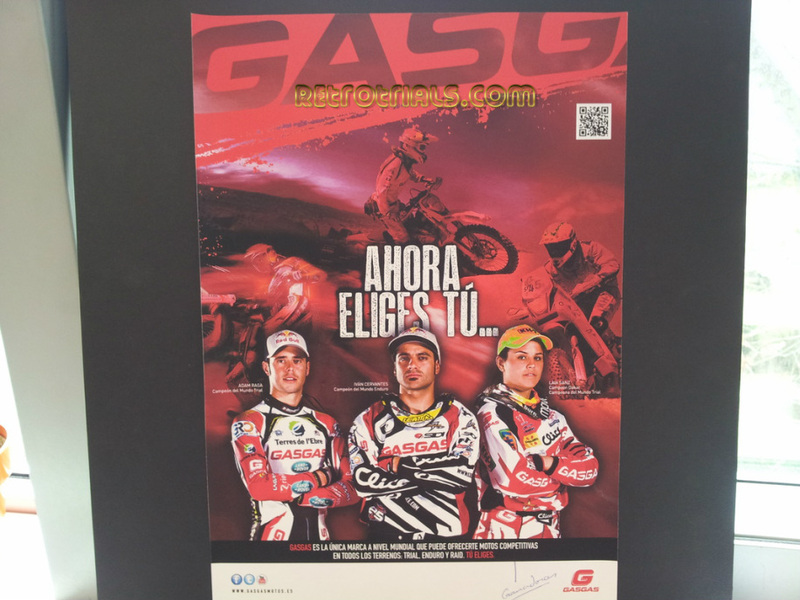 GasGas are trying to expand into the enduro market there but they say that the Asian markets are difficult due to the existence of the Japanese 4. GasGas prefer to sell two strokes. They have to buy the 4 stroke engine from Yamaha and this cuts their profit margin. There is no current development of the 4 stroke engine as the regulations change so quickly it is difficult to keep up with them. 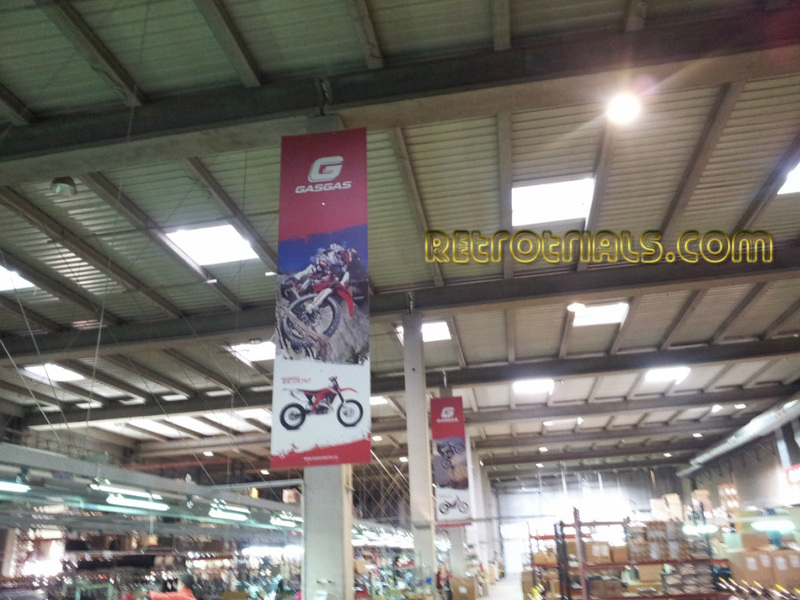 The 2 photos beneath were the only photos that GasGas permitted in the parts department.